This unofficial Obama ad, released by 60 Frames, builds on the famous “Wassup” Budweiser campaign from 2000 that got DDB a Cannes Grand Prix and a Grand Clio. Eight years later, instead of relaxing “seeing the game, having a bud”, the friends are now stressing over War in Iraq, economic and environmental catastrophes, unemployment, home foreclosure and rising healthcare bills. The sequence acts as a powerful indictment of the disastrous Bush years, to which McCain is almost subliminally linked (if you pay attention, you can distinctly hear McCain’s “evil wizard” voice coming from the TV set at the beginning of the ad). Taking on the upbeat nation portrayed in the original 2000 campaign, Bush now leaves a busted and depressed country, in which the most positive character is actually the one fighting in Iraq (although it could be said that’s just because 60 Frames wouldn’t dare to serve voters more graphic imagery than a soldier calling home from a payphone – and, by the way, they were smart not to overpress the point). After all the gloom and doom, however, there’s a soothing note, as an Obama ad plays on the TV set, prompting the hopeful line that “change” is coming. Yes, the country may be broken, but there’s no reason to start hanging ourselves from the ceiling. Well, not yet at least – we can always leave that rope in reserve, just in case we wake up on November 5th to the doomsday scenario of Palin walking around in the Oval Office without a straitjacket. Fortunately, though, that’s looking increasingly unlikely. And in case you pick up the phone to one of those McCain’s robocalls, you can just shout back “Wassup! !” I bet that will make you feel a whole lot better. Obama, Bond in a BMW. McCain, Jack Bauer in a Ford. If Obama was a car brand, what would it be? According to a just released survey, he would be a posh BMW. John McCain, on the other hand, would have to conform with the more blue-collar – but extremely “real American” – Ford. No wonder, then, that Obama would be driving that BMW as the übercool James Bond, while McCain would be thrusting away in a Ford pick-up as the red-blooded Jack Bauer. Well, at least that’s what respondents to the just released 2008 Presidential ImagePower survey say. With voters striving to survive the barrage of polls and surveys thrown at them 24/7 by every media outlet, branding guru Landor and market research firm Penn, Schoen & Berland found a clever way to still get some of that ever-shortening attention span. Forget all those dull questions like “who do you see as more trustful” or “which candidate do you regard as more reliable on the economy”. Right, like any of that really mattered. At the end of the day, people will vote for the candidate they like the most, and they choose it based on the narrative he has attached. The rest is just pointless babble. In this consumerism-plagued world, what better way would there be to gauge the narrative attached to each candidate than to find out what brands people identify them with? So, in a repeat of the exercise premiered in 2004, the Presidential ImagePower survey now pitched Obama, McCain, Palin and Biden against a set of brands, in 15 categories, to see how people perceive them. In most categories, the brands selected for each candidate reflect the common perceptions about both men. When asked to name some attributes for the candidates, people characterized the Democratic nominee as charming, approachable, compassionate, intelligent and unifying, while his GOP opponent was seen as strong, reliable and respected. So, while Obama is a Google, McCain is a AOL. 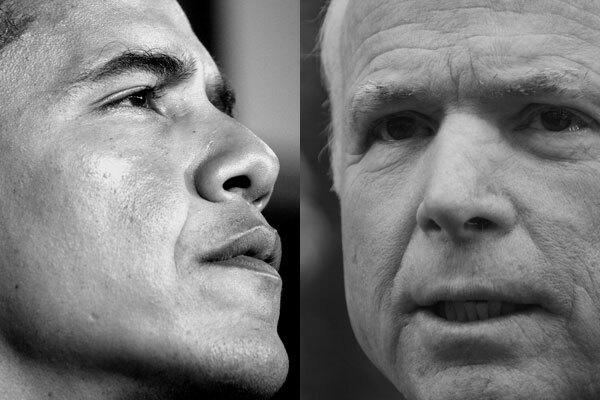 Where McCain is a Wall-Mart, Obama is a Target. There are also some similarities, with both candidates being identified with the game-changing Ipod, as well as with Starbucks and MySpace. Each of this brands is seen as transformative, and this is how both Obama and McCain are perceived. One being the eternal Republican maverick and the other the first black candidate to the presidency, there’s no great jolts there. There are, however, some startling surprises. In almost half of the categories (7 out of 15), respondents attributed the same brands to Obama and… Sarah Palin! They are, for instance, both identified with Google and People Magazine. Will Palin be shocked to find herself in such, uh, “un-American” company? The similarities are even more pronounced between McCain and the Democratic candidate to the vice-presidency, Joe Biden. They share brands in 12 of the 15 categories. In a presidential race that is all about change, both tickets have strived to stake a claim to the concept. As Scott Siff, exec VP at Penn, Schoen & Berland explains, “this similarity in the candidates’ brand strategies also indicates that whichever candidate best achieves the positioning they are both trying to claim may well be the winner on November 4”. According to branding laws, this should spell victory for Obama. The Democratic candidate, having been the first to position himself over the “change” axis, shall have the top-of-mind advantage – something very hard to beat. However, before we start chanting “President Obama”, it must be pointed out that the 2008 results mirror the 2004 survey in identifying the Republican candidate with mass-market brands, whilst the Democrat is identified with premium ones. And we all know how that election turned out. So, what to make of this? Will the top-of-mind rule award victory to the Democratic well-constructed narrative of change? Or will Palin’s “real America” come out on top at the end, and again push the red-blooded, down-to-earth guy all the way to the White House? Could offshore drilling cost Obama the Presidency? The House of Representatives today passed a bill allowing for off-shore drilling in the US coasts. The Democrats have been strongly against the measure, but now they decided to cave in and allow for drilling to take place between 50 miles (80 km) and 100 miles (160 km) off the coast. For years the issue has been an even-splitter, with as much support for extended drilling as for conservation efforts. But the recent surge in oil prices – which saw gas jump to over $4 a gallon in the US – caused a shift in public opinion. A recent Gallup poll found 57% of Americans now supporting offshore drilling, with 41% still against it. Looking to ride the wave of public feeling on the matter, the McCain campaign has made the issue a constant talking point, with McCain being a very vocal supporter of offshore drilling. That wasn’t always the case. In fact, until May this year, John McCain was against offshore drilling. But then he decided to ditch the maverick approach and get with the conservative program. Now it’s time for the Democrats to also switch tracks on the matter. Nancy Pelosi, the House Speaker and a Florida Representative, was staunchly against offshore drilling, pledging that she would not budge because she was “trying to save the planet”. Well, now she just did. She may not have had a choice, at least since Obama opened the way to the turn-around when he recently signaled that he would look favorably on a compromise on the issue. It’s true that Senator Obama wrapped his change of position – from “no, never” to “well, just a little” – in very sensible words about compromise and moving forward on the subject of Energy Security. I’s also true that the measure that today passed the House is a very watered-down version of the bill the Republicans wanted. Instead of the 3-mile limit they were after, a 50-mile limit will be imposed, which is no small difference: according to estimates, 90% of the oil lying off the US coasts is within this 50-mile limit, and would as such be off-limits to oil exploration. Some may see it as a smart move from the Democratic camp: defuse an explosive subject that was working well for McCain, while ceding little ground on the matter. Actually, what the Democrats did was add vinegar to the wound. Even a Republican-style full opening of off-shore drilling would have little impact US energy independence, and none in short-term fuel prices. The Democratic-endorsed bill will have, for all the fanfare surrounding it, an even more risible effect. However, in the political world the fanfare is, as they say, “of the essence”, and it’s in this respect that the Democrats have made a blunder. First, that they are trying to deceive the public – already the McCain camp is portraying this as a mere token effort to address the issue without actually moving forward – which has some measure of truth in it. Second, and most damaging, it exposes the Obama campaign to charges of flip-flopping. True, McCain also changed his tune. However, it’s not as bad for McCain to flip-flop on this matter, since he is actually falling in line with the expected conservative position of “drill, baby, drill”. Obama doesn’t have the same get-out-of-jail card, since he will be perceived as abandoning the long-standing Democratic position on the matter and as bending with the wind on a crucial matter. As recently as June this year, Obama was pledging that, if elected President, he would continue to uphold the moratorium on offshore drilling. He noted that this stance “may not poll well”, and accused his rival of changing his position to appease the public sentiment. Obama concluded that his job was not to “go with the polls”, but to “tell the American people the truth about what’s going to work when it comes to our long-term energy future”. He should have stuck with that position and prized consistency over this kind of expedients. The Democrats understood that being perceived as not doing anything to lower gas prices was a risk they couldn’t afford. Well, they’re wrong. Being perceived as inconsistent is the risk they can’t afford. Whereas McCain is reenforcing the consistency of the Republican message with his flip-flopping, Obama is weakening his, and muddling the Democratic positioning in the voters’ mind. At a time when the two candidates are shoulder to shoulder on the polls, that is something that he should not want to do. With the specter of John Kerry hanging over the matter, we have to ask ourselves: could this bill cost Obama the Presidency? Matt Damon raises the horrifying scenario of Palin moving over to the Oval office. A very real possibility – let’s not forget that McCain is already 72 years old, and nobody lasts forever. Climate change is already a huge question mark hanging over the future of mankind. But would the world survive the Barracuda President?